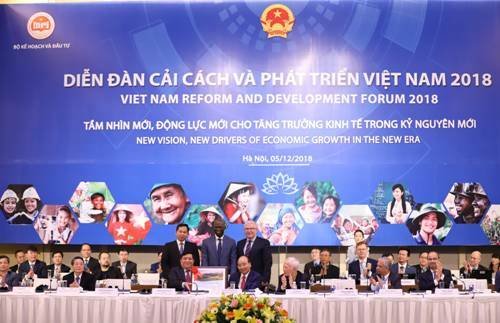 Viet Nam economic policy framework makes debut on December 5 at the Viet Nam Reform and Development Forum (VRDF). The document collects the Party and State’s guideline and policies, updates the world’s new happenings and refers to the Report 2035 to introduce Viet Nam’s mid and long-term development policies. The document conveys to the business community, international organizations, managers and Vietnamese people a clear message the determinations to building a State of creativity, development, action and integrity for further enhancing innovation, improving the business environment and mobilizing all resources for establishing a nation of prosperity, harmonization and sustainability, asserted PM Nguyen Xuan Phuc at the event. According to the print, the mid and long-term development goals till 2035, Viet Nam will become a middle-income nation with the GDP per capita of US$10,000 and more than half of the population will join the global middle class. Reforms concentrate on modernization of the economy and development of the private sector, building national innovation capacity, improvement of economic effectiveness of urbanization and territorial development, modern institution and effective State. Other issues are referred in the print including sustainable development of environment and enhancement of climate change adaption capacity as well as ensuring equality and promotion of social integration. Growth motives are defined such as the streamlined, effective and efficient political system, modern and synchronous infrastructure, human resources and innovation and private sector development. The establishment of Viet Nam economic policy framework has been carried out since the end of 2017.